Following its record breaking West End run, this powerful new production of Reginald Rose’s gripping courtroom thriller Twelve Angry Men has been hailed as the “classiest, most intelligent drama in the West End”. It brings to the stage the taut brilliance of the 1957 three-time Academy Award nominated film which starred Henry Fonda and is considered to be one of the great ‘must-see’ movies of all time. Tom Conti is one of the most respected and celebrated actors of his generation. Unforgettable as the leading man in hit films such as Merry Christmas Mr Lawrence and Shirley Valentine, he has also appeared as a myriad of different characters on both the big and small screens as well as on stage. Recent movies include The Dark Knight Rises and Street Dance. Awards include the Olivier Award and Tony Award for his stage performance in Whose Life is it Anyway? and a Best Actor Oscar nomination for his role in Reuben Reuben. He and Dame Judi Dench were recently jointly voted the Most Popular Actors in the West End in the last 25 years. Now it’s your turn to witness a ‘BRILLIANT’, ‘RIVETING’, ‘TRIUMPH’of a show. The play concerns the deliberations of the jury of a homicide trial. At the beginning, they have a nearly unanimous decision of guilty, with a single dissenter in Juror 8 questioning the validity of the evidence they were presented with in the court room, who throughout the play sows a seed of reasonable doubt. It was first made as a 1954 teleplay by Reginald Rose for the Studio One anthology television series, and was aired as a CBS live production on 20 September 1954. The drama was later rewritten for the stage in 1955 under the same title. Here is a simple diagram of the stage layout as best I could remember it. The blue bars at the top are windows with in the second half have water drizzling down them to represent the ongoing storm outside. The red bars are the tables. 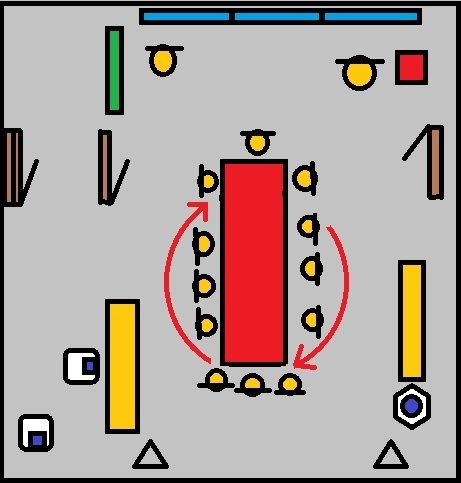 The central one revolved during the performance (and the direction is gradually turned in doing a full revolution by the end).The yellow circles with the lines are chairs. The yellow bars are the benches. The green bar is the coat rail. The brown bars are the doors (the left most was a toilet cubicle leading off stage). The triangles are where the lighting pillars were. The hexagon, with a blue circle, was the water cooler. The rounded corner squares with blue inner squares were the wash hand basins where a few conversations occurred as asides between some jurors. The set design is effective and there is no scenery which blocks you view of events on stage. Similar to a recent production of ‘Dial M for Murder’ I saw there seems to be a trend to rotate scenes on stage to, at best, provide a visually different perspective on events, or worst, keep modern attention deficit audiences visually stimulated. During the intermission there was more than one conversation I heard from other groups discussing how they noticed the central table being rotated and debating whether it was the cast doing this of the turning circle of the stage floor (it was the stage floor which has a rotating circle where the table and chairs surrounding it were placed). The Cast are: – Juror 1: Andrew Frame, Juror 2: David Calvitto, Juror 3: Andrew Lancel, Juror 4: Robert Duncan, Juror 5: Alexander Forsyth, Juror 6: Mark Carter, Juror 7: Sean Power, Juror 8: Tom Conti, Juror 9: Paul Beech, Juror 10: Denis Lill, Juror 11: Edward Halsted, Juror 12: Gareth David-Lloyd and Guard: Jon Carver. The performance lasts approximately 2 hours 10 minutes including a 20 minute interval. Juror 1: The Foreman: (Andrew Frame) The jury foreman, somewhat preoccupied with his duties; proves to be accommodating to others. An assistant high school football coach. Tends to attempt to prevent heated arguments. Ninth to enter a vote of not guilty. He represents the balance of debate within the American legal system where the Socratic Method is employed. Each side gets to voice its side but, unlike the impassioned speeches we are used to seeing in American court room dramas, to be done so in a measured manner of comment and rebuttal. His voting later indicates that not only possible, but reasonable, doubt has been cast on the reliability of the case. Though he represents a balanced view by being told he is an assistant highschool football coach we are also being informed of his character as an individual i.e. he is a team player, an authoritarian who respects the authority of his superiors. This is why he holds out as long as he does until voting not guilty – not because he cannot see Juror 8’s logic but that in a sense he believes as there has been a murderer so there must be a culprit and the song is the only one ever presented during the play. Only when all the evidence is easily challenged and the verdict of guilty will lead a highly likely, if not innocent then at least justified murder done in self-defence, boy to being executed. Juror 2: (David Calvitto) A meek and unpretentious bank clerk who is at first domineered by others but finds his voice as the discussion goes on. Fifth to enter a vote of not guilty. He represents those in society who fear to make their voices heard and more often than not go with the general consensus which can lead to bad consequences as seen with the people of Germany who did not challenge the Nazi party though many knew what was happening in their name was wrong. To be honest I don’t really remember much of this character ironically. Juror 3: (Andrew Lancell) A businessman and distraught father, opinionated and stubborn with a temper; the antagonist. Twelfth to enter a vote of not guilty. A person ruled by his emotions and unable to be logically objective as a jury member. He sees the defendant as a potential version of his son and in seeing this wishes to excise the thought of it by punishing him. He therefore is the worst sort of person for jury duty as he cannot view the case by its own merits but rather brings to it all his inherent prejudices which influence his actions. As a businessman he is a respectable member of society so he is worse than some of the more negatively portrayed jurors as there is a façade of respectability when we are often presented with his being the least rational. The end of the first act concludes with him becoming violently angry with juror 8, who has constantly tested him, leading him to shouting ‘I’ll kill him’ while being restrained by other jurors. This declaration proves Juror 8’s point that someone will passionately declare this though it is rhetoric and does not mean the person has any intent in actually doing this. Juror 4: (Robert Duncan) A rational stockbroker, unflappable, self-assured, and analytical. Eleventh to enter a vote of not guilty. Perhaps the most logical of the jurors but one who needs to have all the evidence be refutable before he will change his vote. In doing this we are shown that although rational he still favours the status quo of believing that as no evidence has been provided in the defendants defence then what does exist must be the only matters considered. This shows the fallacy then of being a completely rational person as, unlike Juror 8 who challenges based on the weakness of the evidence, we find with this character that omission is not taken into consideration. To him only what is presented to him exists and in doing this he is easily misguided for example when the female defendant shows signs of being a glasses wearer but doesn’t do so in court and the matter that she may not have seen what she believes she saw is brought into contention. Juror 5: (Alexander Forsyth) A soft-spoken young man from a violent slum, in the book a Milwaukee Brewers fan, in the movies and on Broadway, a Baltimore Orioles fan. Third to enter a vote of not guilty. This juror represents empathy towards others in decision making as he can identify with the defendants situation having come from a similar background. He is the one who is first accused of changing his vote due to this and although he is not it is one of the earliest reassessments that occur in the play. Why then did he vote guilty initially? Because of social pressure perhaps? There was a crime there must be a culprit though of course at the end of the play we are only told of and concerned by the decision to acquit the defendant not with who did or did not commit the murder. Juror 6: (Mark Carter) A house painter, tough but principled and respectful. Sixth to enter a vote of not guilty. He often stands up to others when they become outspoken and aggressive. He is the common man of the play representing that people understand the difference between right and wrong but are ruled over by the majority. He therefore is the middle ground of all the jurors and so it is no coincidence he therefore is the ‘middle’ most vote during the entire process. Juror 7: (Sean Power) A salesman, sports fan, superficial and indifferent to the deliberations. Seventh to enter a vote of not guilty. A person who does not care for the verdict as long as he gets to do what he wants. He is the most distraught at the start of the play as having to discuss the verdict means he won’t be able to go see the sports game he has tickets for. When during the second part a storm means the game is a wash out he becomes more amicable and quiet. However it should be noted his reason for voting not guilty is not so much out of a belief that the defendant is innocent as much as to ‘tip the scales’ so that he is with the majority and thus ‘hedging his bets’. He therefore represents the sort of person who nowadays can often be heard saying ‘what is the point of voting? It doesn’t affect my life’. A short sighted individual only concerned with their own matters and apathetic to others. Juror 8: (Tom Conti) An architect, the first dissenter and protagonist. Identified as “Davis” at the end. The first to enter a vote of not guilty thus setting off the events of the play. He sees the flaw in the logic of the evidence provided and does not go with the majority and vote with them for an easy life as others may have. We are told he is an architect, a professional, and in doing so we are presented with the bias of the play unfortunately in that many of the professional people are logical while the working classes are ruled by their prejudices and emotions (with two key exceptions in Jurors 3 (too emotionally guided), 4 (too rational and unable to imagine the alternatives not presented). Of course this is not an ironclad rule and we see during the course of events various facets to each character but it does seem to be an overarching aspect to the play where the working class characters will shout while the professionals will speak far more calmly. It is possible it was just the production I saw which gave this impression however. Juror 8 is the idealised protagonist, a person who will stand for what is right no matter how much opposition there is, who never is really challenged successfully in his views though on at least one occasion he actively antagonises a juror into anger to get the reaction of being told ‘I’ll kill him!’ so he is not without a dark side. Juror 9: (Paul Beech) A wise and observant elderly man. Identified as “McCardle” at the end. Second to enter a vote of not guilty. Someone who has much life experience and perhaps is suggested to have become more liberal with age. He sides with Juror 8 not completely out of agreement but because there is the possibility of there being something to what he has said in challenging the status quo. He however waits until the secret ballot before agreeing showing us that although the older generation may still have a standpoint to provide the are easily put to one side and require others to be the ‘hot blooded’ individual to cast the first stone. He is a figure of respect throughout the play though it is only in offering support and perspective via his life experience in contrast to the younger members of the jury. Juror 10: (Denis Lill) A garage owner; a pushy and loud mouthed bigot. Tenth to enter a vote of not guilty. The stereotypical working class figure as written by the middle classes. His saving grace in the play is that unlike the businessman Juror 3 he is not expected to know better and thus although he also allows his prejudice to rule his logic he is more excused for it that the ‘antagonist’ Juror 3. Juror 11: (Edward Halstead) A thoughtful German watchmaker and naturalized American citizen. Fourth to enter a vote of not guilty. He provides a perspective from outside American society. In practise this shows that when he is presented with a fair challenge to the majority view. The play was originally written in 1957 so it is hard to not assume the character was not in Germany during the Nazi regime. Is this then the playwright’s commentary on how the people of Germany, by now fully aware of the atrocities performed in their name, are not ambivalent to other’s suffering and should not be held personally responsible for what the regime did? He provides wordy contributions as if to enact the freedom of speech he has gained in America which was denied to him in Germany. Though it is not addressed as aggressively as it may have been in a real life version of this situation you can imagine he has faced persecution and prejudice and in doing so can identify with being unfairly judged. He therefore represents sympathy where Juror 5 represented empathy. Juror 12: (Gareth David-Lloyd) A wisecracking, indecisive advertising executive. Eighth to enter a vote of not guilty. He talks big but his vote is easily changed from one to the next. As an advertising executive we see how easily swayed he is in his opinion in order to appease the majority. He switches it back and forth in a matter of minutes based on only small changes in opinion in the others. The playwright no doubt is commenting on the façade of respectable society which so easily can be swayed by external forces. The Guard: (Jon Carver). I am not sure if he is the voice at the start of the play, when the ensemble are sat on the benches at the front of the stage ‘in court’ being informed, along with the audience, what their deliberation requires. That it must be a unanimous vote in this case, due to it being a homicide, so they must have unanimous agreement amongst themselves whether the 16 year old defendant is guilty of murdering his father or not. His only real role in the play is to bring on required items like the knife and the floor plan of the apartments. Review: As it is an ensemble play it feels unfair to cite one person over another as standing out in the play. Indeed, if anything, standing out would be detrimental to the piece. Tom Conti’s voice doesn’t tonally lend itself to doing a satisfying American accent unfortunately although a few of the others also adopt broad American accents that we would associate with the 1950s so it is in keeping with the others. Gareth David-Lloyd, of the more prominent characters, has one of the better accents and I have to admit I would not have realised he was the same person who played Torchwood’s Ianto unless I had seen his name in the brochure. If I had one criticism it would be the revolving central table. Similar to a recent production of ‘Dial M for Murder’ I saw there seems to be a trend to rotate scenes on stage to, at best, provide a visually different perspective on events, or worst, keep modern attention deficit audiences visually stimulated. During the intermission there was more than one conversation I heard from other groups discussing how they noticed the central table being rotated and debating whether it was the cast doing this of the turning circle of the stage floor (it was the stage floor). It seemed very distracting and, to me, a poor choice as there are multiple other pieces of scenery which remain static throughout the play thus giving the impression the table turning is happening in the reality of the play and not being commented on by anyone as ridiculous as that is to read. Very much in the style of chamber dramas, plays occurring in a single room, there felt no need to include the revolving table. Regarding the marketing its clear they have superimposed replacement actors heads onto the cast of the original run. some of it is okay but on the whole it all seems slapdash and really makes the posters look ugly thoguh i appreciate it is not as if people will look as closely as I did or actually be bothered about it. I am just one of those people who notices these things and lament the loss of the time when marketing involved more than just using basic photshop skills to edit a photograph while abusing filters and basic typography settings. Film posters are far more guilty of this than stage productions however i will admit. I enjoyed it as a morality play and felt the cast is quite strong. If you get a chance to see it by all means do though I think it is heavily reliant not only in casting good actors but in them working well as an ensemble so there can be no guarantee that big names will result in satisfying performances. I thought this production did well and certainly has received a wide number of accolades. If you can catch it during its tour it is definitely worth going to see. Next time on the misadventures of blogging… a food or drink review.